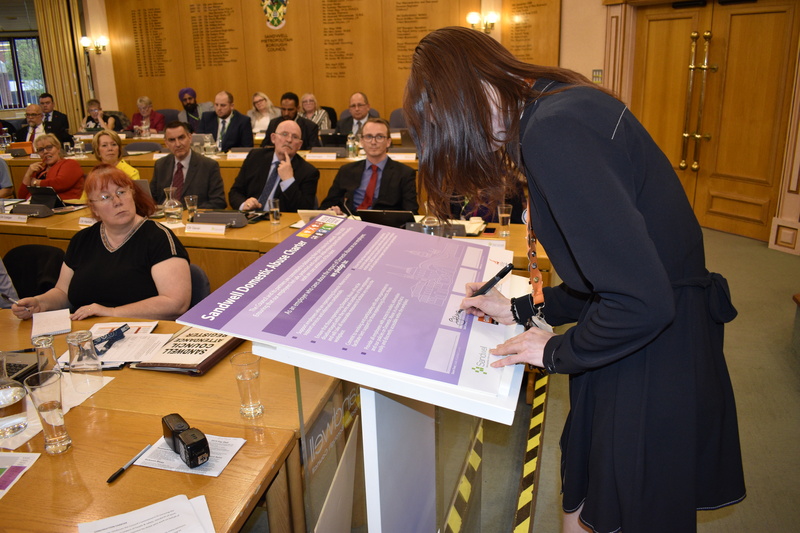 Sandwell Council has become the first employer to sign up to GMB’s domestic abuse charter. The local authority rubber stamped the deal at a full council meeting last night [Tuesday, April 9, 2019]. More than 4,000 Sandwell Council staff will now be protected by the charter. GMB’s ‘Work to Stop Domestic Violence’ charter was launched in Parliament last year. The charter calls on employers to support employees experiencing domestic abuse to ensure they will not be disadvantaged at work, will be supported with access to services and information and that all employers train staff to be able to appropriately and confidently support staff. Data from the Crime Survey for England and Wales (CSEW) for the year ending March 2018, showed an estimated 2.0 million adults aged 16 to 59 years experienced domestic abuse in the last year (1.3 million women, 695,000 men). GMB has released anonymous testimony from members who have experienced domestic abuse – and the importance of having supportive employers. “We are pleased that Sandwell Council, one of the borough’s largest employers recognise that domestic abuse is a workplace issue and are actively supporting staff who may be affected.